An excellent conversation talking about "shopaholic". My students loved it. The class was pretty funny. My students simply loved this activity and they also developed a nice conversation about the difference between boys and girls. I hope you like it. You teacher can practise many things with your students. There is a reading part, comprehesion and also one listenting where it works to emphasize what they have been reading and discussing. 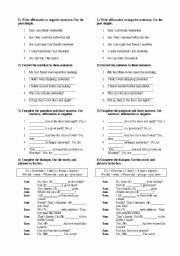 I�ve passed this movie worksheet to my 9-12-year-old students recently. They simply loved the movie and the exercise is very practical. 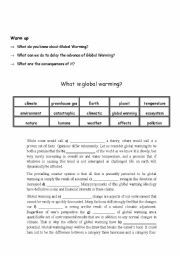 I�ve been discussing Global Warming with my students, then I�ve prepared this worksheet to make the class easier for them. The answers are already included. A simple exercise just to emphasize the past simple. 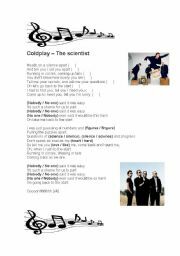 A good and simple song to work with students and practise the listening part. 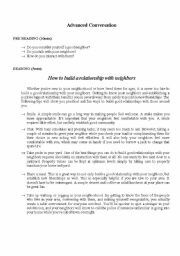 This theme - neighbours - always develops a good conversation among students. They share experiences among themselves and have much fun. My class was really pleasant and my students loved. 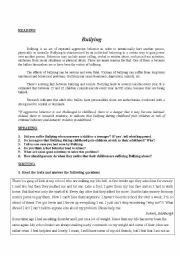 An interesting article that talk about bullyng and comes an exercise to practice and talk about our own experiences. I needed to divide this ppt. in 3 parts. I�ve been sending you. I hope you like. My students simply loved it. I needed to divide this ppt. in 3 parts. I�ve been sending you. I hope you like. My student simply loved it. 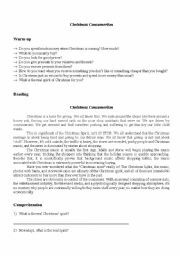 Subjunctive�s grammar and also exercises to complement it. Simple examples to teach the possessive adjectives. With this ppt. you can practise few prepositions and then review places in town that were shown in the ppt. before. With this ppt. you can work few places in town and also practise pronunciation. With this ppt. you teacher can develop an interesting conversation abou junk food, the positive and negative points about eating it and also the benefits that healthy food can bring for us. 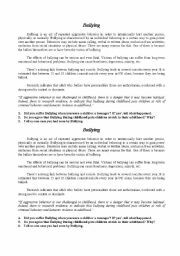 This power point it�s a good option to work with children. It�s easy and practical for them and also for the teacher, who is going to handle with it.